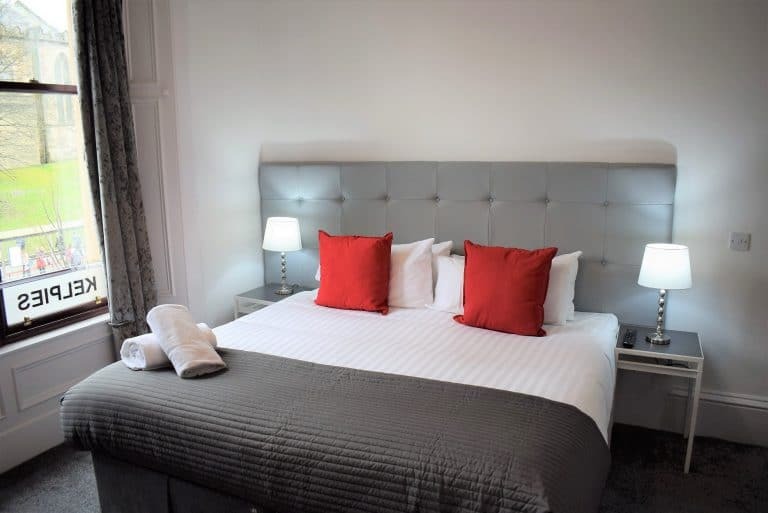 Kelpies Serviced Apartments- Newmarket Street are situated in the heart of Falkirk town centre, only 150 yards from Falkirk Grahamston train station offering direct links to Edinburgh and Glasgow within 30 minutes. All local amenities, shops, restaurants, bars, gyms and a cinema complex are also right on your doorstep. Falkirk’s main bus Services are directly across from the apartments offering frequent services throughout the day. The Newmarket Street Taxi Rank is also directly across from the apartments. Direct motorway links to the M8 and M9 are also close by. The Apartments are located an 8 Minute drive to the Falkirk Wheel and 6 minute drive to the Kelpies and Helix Park. Other popular local attractions such as Callander House, Kinneil Heritage Railway, Dollar park and many more are all within a short drive away. The nearest airport is Edinburgh Airport, 28 minutes from the apartments. Great for couples, families, business and solo travellers. Parking is available at a location nearby reservation is not needed and charges may apply. 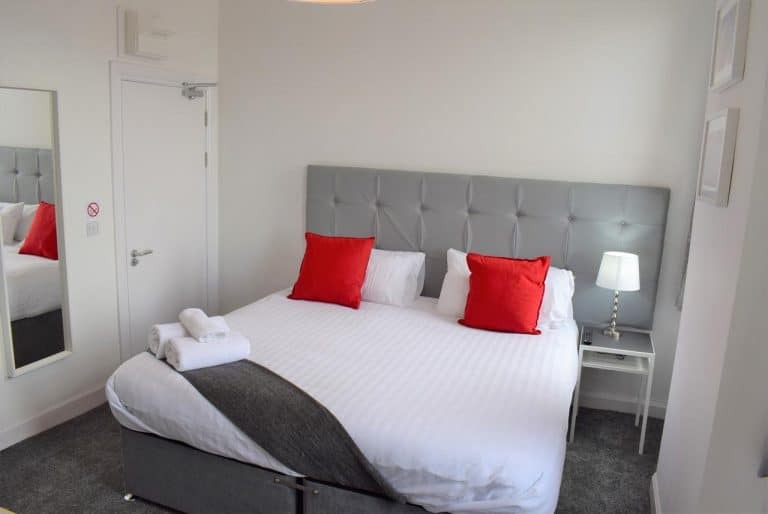 Kelpies Serviced Apartments- Newmarket Street are situated in the heart of Falkirk town centre, only 150 yards from Falkirk Grahamston train station offering direct links to Edinburgh and Glasgow within 30 minutes. All local amenities, shops, restaurants, bars, gyms and a cinema complex are right on your doorstep. Falkirk’s main bus services are directly across from the apartments offering frequent services throughout the day. The Newmarket Street Taxi Rank is also directly across from the apartments. Directly across from the apartments. Direct Motorway links to the M8 and M9 are also close by. The apartments are located an 8 minute drive to the Falkirk Wheel and a 6 minute drive to the Helix Park. Other popular local attractions such as Callander House, Kinneil Heritage Railway, Dollar Park and many more are also within a short drive away. 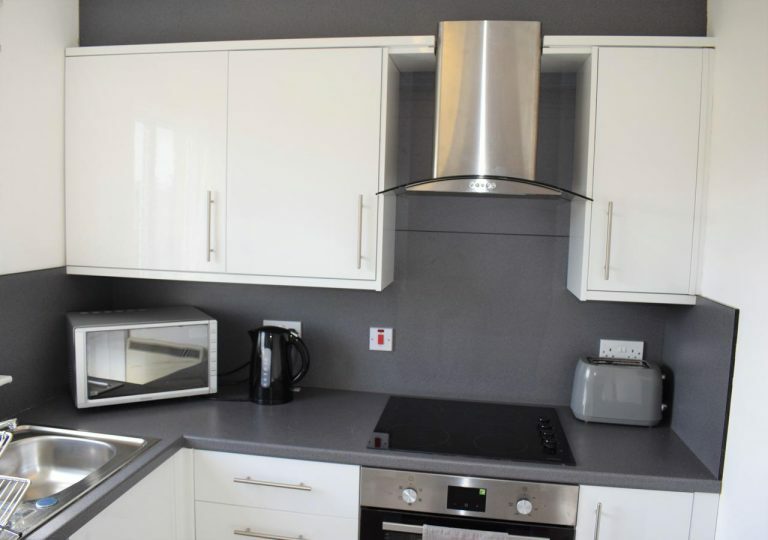 The McKay Apartment offers luxurious furnishings and is fully equipped with modern appliances offering all the comforts of home with the added advantage of the rear garden to wind the summer nights down in. Fast speed Wi-Fi is offered complimentary throughout the whole apartment as are all plush linen and towels. We have provided all of the essentials you would expect from a home from home stay. The apartment has two bedrooms and can accommodate up to 4 adults comfortably. 13 minutes drive to the Falkirk Wheel and 10 minutes drive to the Kelpies and Helix Park. 13 minutes drive to INEOS in Grangemouth. The Bruce Apartment is close to all major tourist attractions such as The Kelpies/Helix Park (7 mins) and The Falkirk Wheel (10 mins), restaurants, pubs, shops, Forth Valley Royal Hospital and business parks. 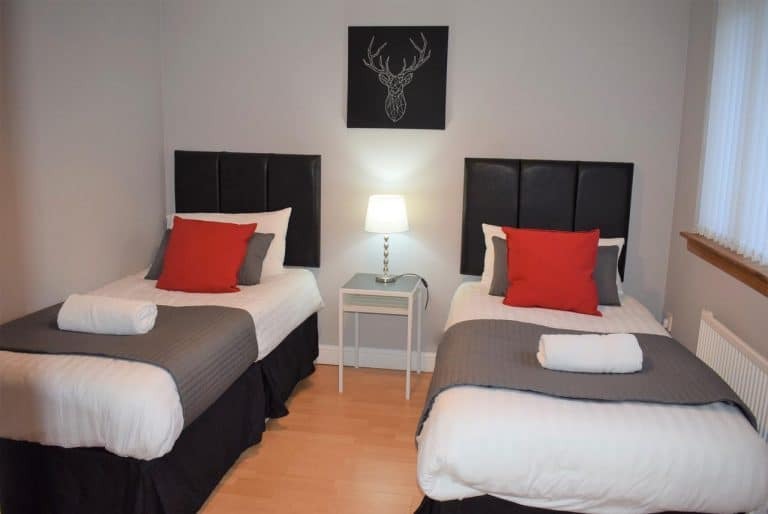 With direct links to major cities such as Edinburgh and Glasgow by train (Larbert Train Station 5 minutes drive away), taxi or Bus connections. The nearest airports are Edinburgh (20 mins) and Glasgow (40 mins). The apartment features 3 bedrooms with 2 twin beds or 2 double beds and can comfortably sleep up to 6 guests. A kitchen comes fully equipped with modern appliances, dining room and two bathrooms are also featured. A flat screen TV and complimentary WI-FI is included for your entertainment throughout the apartment. The apartment also has private parking included. 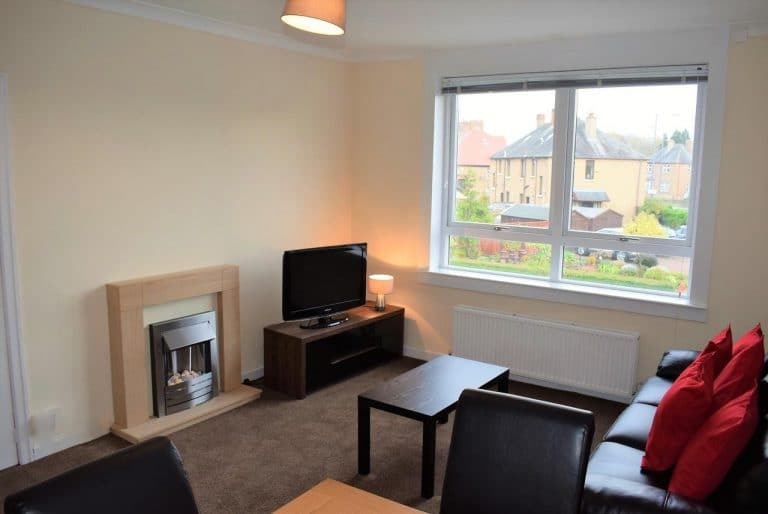 The Russell Apartment is located close to all major tourist attractions such as The Kelpies/Helix Park (7 mins) and The Falkirk Wheel (10 mins), restaurants, pubs, shops, Forth Valley Royal Hospital and business parks. 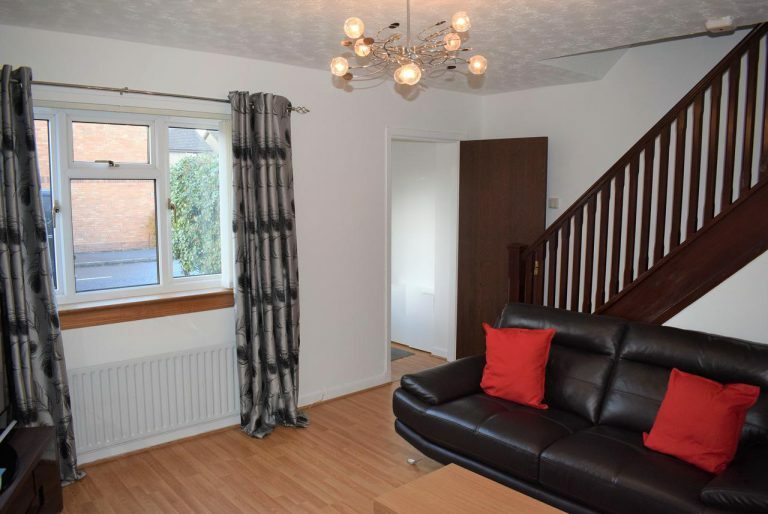 With direct links to major cities such as Edinburgh and Glasgow by train (5 minute walk to Larbert Train Station), taxi or Bus connections. The nearest airports are Edinburgh (20 mins) and Glasgow (40 mins). The apartment features 2 bedrooms with 2 twin beds that can sleep up to 4 guests comfortably. A fully equipped kitchen with modern appliances and conservatory is also included. A flat screen TV and complimentary WI-FI is included for your entertainment throughout the apartment. The apartment also has private parking. 12 minute drive to INEOS in Grangemouth. The MacGregor Apartment is located close to all major tourist attractions such as The Kelpies/Helix Park (6 mins) and The Falkirk Wheel (16 mins), restaurants, pubs, shops and business parks. With direct links to major cities such as Edinburgh and Glasgow by train (Falkirk Grahamston or Falkirk High Station), taxi or Bus connections. The nearest airports are Edinburgh (21 mins) and Glasgow (41 mins). The apartment features 2 bedrooms with 2 twin beds and can comfortably sleep up to 4 people, a kitchen fully equipped with modern appliances is also included. A flat screen TV and complimentary WI-FI is provided for your entertainment throughout your stay. INEOS in Grangemouth is a 5 minute drive from the apartment. Offering free WiFi and garden views, Kelpies Serviced Apartments- Bruce is an accommodation located in Larbert, 900 yards from Larbert Train Station, offering direct links to Edinburgh, Glasgow and Stirling. Larbert itself is only 10 minutes from Falkirk which offers many interesting attractions including; The Falkirk Wheel, The Helix, Callander House, Kinneil Heritage Railway, good shopping and leisure facilities. The apartment offers luxurious furnishings and is fully equipped with modern appliances offering all the comforts of home. Fast speed Wi-Fi is offered complimentary throughout the whole apartment as are all plush linen and towels. We have provided all of the essentials you would expect from a home from home stay. The apartment can accommodate up to 5 adults comfortably. Tattoo, Book Festival and Film Festival. INEOS Refinery in Grangemouth is just a short 10 minute drive from the apartment. Kelpies Serviced Apartments – McDonald offers accommodation in Falkirk, 2.7 miles from Falkirk Wheel and 0.9 miles from Callendar House. Guests staying at this apartment have access to free WiFi and a fully equipped kitchen. With the apartment being located in Falkirk, Central Scotland it is situated perfectly with access to the entire country via the major highway links that run through the area very close by. The two main rail stations are within minutes drive of the property- Falkirk Grahamston & Falkirk High. They offer frequent, fast services to Edinburgh (24 mins), Glasgow (18 mins), Stirling (16 mins) and beyond. Falkirk itself offers many interesting attractions including; The Falkirk Wheel, The Helix, Callander House, Kinneil Heritage Railway, good shopping and leisure facilities. Great access to Edinburgh and Glasgow Airport and Edinburghs Christmas Markets, Hogmanay, Military Tattoo, Book Festival and Film Festival. INEOS Refinery in Grangemouth is just a short 10 minute drive from the apartment. The apartment features a fully equipped kitchen with oven, fridge, freezer, microwave and washing machine. The apartment can accommodate up to 4 guest and amenities such as luxurious bed linen, towels and free Wi-Fi are also provided. 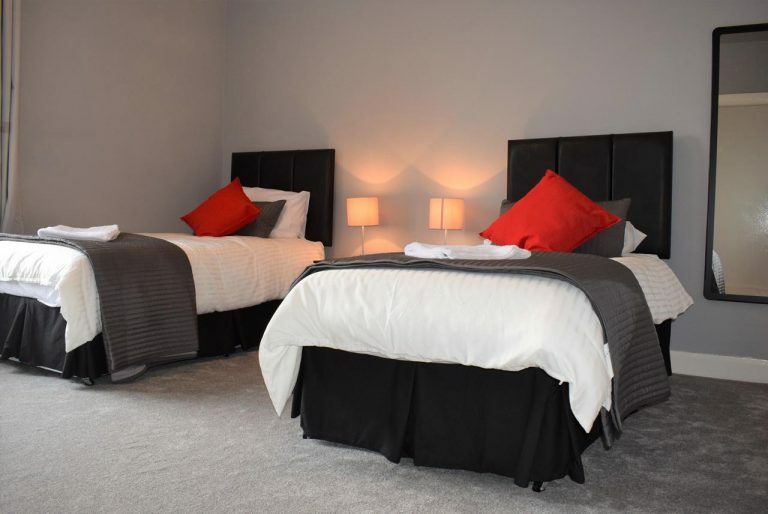 Kelpies Serviced Apartments – Alexander is an accommodation situated in Falkirk, 2.7 miles from Falkirk Wheel and 1.2 miles from Callendar House. Guests have access to free WiFi. The apartment offers luxurious furnishings and is fully equipped with modern appliances offering all the comforts of home. Fast speed Wi-Fi is offered complimentary throughout the whole apartment as are all plush linen and towels. We have provided all of the essentials you would expect from a home from home stay. The apartment can accommodate up to 4 adults comfortably. The apartment features a fully equipped kitchen with oven, fridge, freezer, microwave and washing machine. The apartment can accommodate up to 4 guest and amenities such as luxurious bed linen, towels and free Wi-Fi are also provided. 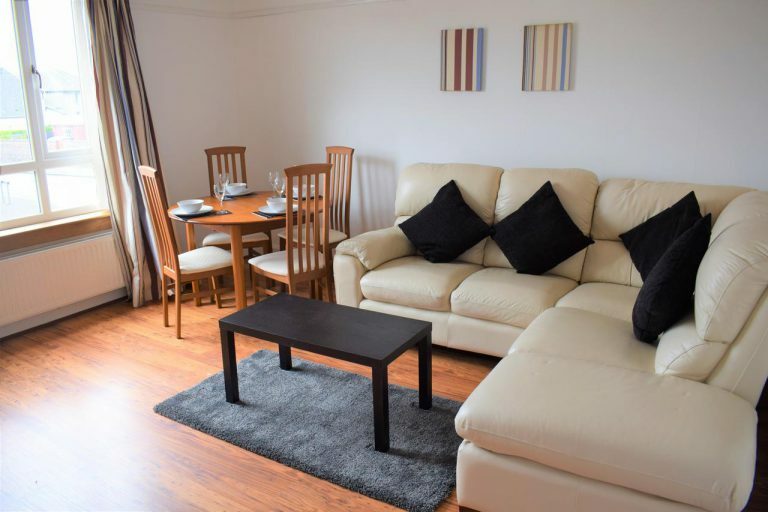 With the apartment being located in Falkirk, Central Scotland it is situated perfectly with access to the entire country via the major highway links that run through the area very close by. The two main rail stations are within minutes drive of the property- Falkirk Grahamston & Falkirk High. They offer frequent, fast services to Edinburgh (24 mins), Glasgow (18 mins), Stirling (16 mins) and beyond. Falkirk itself offers many interesting attractions including; The Falkirk Wheel, The Helix, Callander House, Kinneil Heritage Railway, good shopping and leisure facilities. Great access to Edinburgh and Glasgow Airport and Edinburghs Christmas Markets, Hogmanay, Military Tattoo, Book Festival and Film Festival. INEOS Refinery in Grangemouth is just a short 10 minute drive from the apartment. Kelpies Serviced Apartments- McCreadie is located in Grangemouth, 2.1 miles from The Helix. Guests staying at this apartment have access to a fully equipped kitchen. The apartment comes with a flat-screen TV. With the apartment being located in Grangemouth, Central Scotland it is situated perfectly with access to the entire country via the major highway links that run through the area very close by. The two main rail stations are within minutes drive of the property- Falkirk Grahamston & Falkirk High. They offer frequent, fast services to Edinburgh (24 mins), Glasgow (18 mins), Stirling (16 mins) and beyond. Falkirk itself offers many interesting attractions including; The Falkirk Wheel, The Helix, Callander House, Kinneil Heritage Railway, good shopping and leisure facilities. Great access to Edinburgh and Glasgow Airport and Edinburghs Christmas Markets, Hogmanay, Military Tattoo, Book Festival and Film Festival. INEOS Refinery in Grangemouth is just a short 10 minute drive from the apartment. The apartment features a fully equipped kitchen with oven, fridge, freezer, microwave and washing machine. The apartment can accommodate up to 4 guest and amenities such as luxurious bed linen, towels and free Wi-Fi are also provided.